Brian Gardner responded to the questionnaire with typical thoughtfulness. Although injury has forced him to retire from running IN 2014, he has found another outlet for his unquenched desire to train and race. As you will read below, despite numerous operations, he has achieved a great deal during his athletic career. Successes he chose not to mention include: Scottish Masters CC titles at M45 and M50; Scottish Masters track wins at 1500, 3000 and 5000; International CC bronze medals in M50 and M55 to go with his M45 triumph; and first places in BMAF M45 10,000m and M50 ten miles. Before all that, he won the British Masters Modern Triathlon (swimming, running and shooting)! He was an invaluable part of the Scottish Masters team in the annual 5 Nations International CC, contributing to four team silver medals and one bronze in three different age groups. In 2001in the Five Nations Masters International at Falkirk, he won M45 team gold for Scotland with Keith Varney, Gerry Gaffney, Archie Jenkins and Nicol Maltman making up the team. We wish him the very best of luck in his new sport. I always liked running around as a child but when I was invited to trial for my primary school’s area sports team, I was too shy to join in! It wasn’t until I ran cross country for my Boys’ Brigade team that I finally plucked up the courage to join Airdrie Harriers just before my 17th birthday. In my last year at Airdrie Academy, my PE teacher, Bobby MacLean, a former Shettleston Harrier, coached me and helped me believe in myself. When I left school, Airdrie Harriers amalgamated with others to form Clyde Valley and I joined Tommy Boyle’s group. Under Tommy’s coaching my 800m time came down to 1:57 and I won my only senior Scottish Championship medals: silver and bronze at 4x400m – by age 20, when I left Scotland to study and work in England and became a cross-country specialist. I’ve been self-coached ever since, although I’ve been influenced by club stalwarts and leaders such as: the late Keith Scott (“You’ll never run faster until you run faster”) of Newbury; Pete Molloy (a World Champion who cited me as an influence in his recent comeback); Howard Moscrop (another World Champion, who also took Swindon into the British League) at Swindon; and SVHC’s Archie Jenkins (always up for it), Colin Youngson (always eloquent) and Davie Fairweather (always there). In my job I should say health, wellbeing and an active lifestyle but it’s none of those! It’s planning and training to the best of your ability – given your limitations – to race as well as you possibly can in the most important competitions. It’s that proud feeling when you go into work on a Monday knowing that you ran a good race at the weekend, and you keep that feeling to yourself because it’s special to you. Only one contender: winning the ‘home’ international cross country (M45) at Croydon in 2004. The build up to the race couldn’t have been better for me: I was winning cross country races outright and setting lifetime pbs on the road. I had planned and trained to the best of my ability and this was the most important race. Although I’d never finished higher than 12th overall before, I knew that if I concentrated and held my nerve, this could be my time. We were held up in the sleet at the start while the organisers found a 1st aider (!) It was difficult to keep warm but I made a cautious start and then threaded my way through the field. With about a mile to go, I knew I was the leading M45 and first Scot overall but England’s Jon Cordingley was trying to get past me. I surged to hold him off several times until I sprinted clear in the home straight. Crossing that finish line was the proudest moment of my life. And it was only after finishing that I learned that I was 5th overall; I had no idea that I’d moved so far up. The support from team mates was heart warming. I’d planned and trained for that win and finally ran as well as I possibly could. Too many contenders! For every performance I was proud of there were at least twice as many that were a disappointment; sometimes because of injury or surgery but mostly because I ran like a donkey. I never won a World Championship. But I didn’t win many national titles, either, so maybe I had ideas above my station. The same season that I won the ‘home’ international I went on to win a poorly supported European Cross Country Championship in Sweden. I felt that I was on a roll and really wanted to try and win something at the next level. I didn’t run overseas again until 2008, when I was 5th(M50) in the World Cross Country Championships in France. That’s the closest I got. And I suppose that your last pbs are all unfulfilled ambitions: for instance, in 1984 my 5,000m time came down from 15:09 to 14:58 to 14:53 to 14:44 and I was dreaming about how much more I could improve. But I missed the next four seasons and never ran any quicker. Team mates, exploring the countryside and mainly the training and competition. I’ve had to miss a lot of that over the years, having had ten operations. The latest was in May, 2014 and that was the third in just over a year. I’ve had more comebacks than Frank Sinatra but this time – for the sake of the future health of my joints – I’m finally calling it a day… permanently. However, I have found a new sport: open water swimming! Just six weeks after handing back my leg brace and crutches and buying my first wet suit, I swam my first race in a lake. And did okay! So, I still have team mates, exploring the countryside, training and competition. And I’ve made another comeback, with a difference! There is life after running! During the cross country season I followed a staple diet of cross country reps, steady runs and a long run on Sundays. The training was always progressive e.g. adding a rep or reducing the recovery and working towards a peak for the major championships. The track season was similar except the reps would be shorter and at 3-5 different paces e.g. 800m/1500m/3,000m. These sessions were usually on grass rather than on the track. At various times of the year I’d run hill reps, build-ups and differential runs. During the past twenty-five years or so, I incorporated cycling and swimming, as I could no longer sustain relatively high mileage. These days I swim 10km per week in five sessions made up of various sets, mostly in a pool but also in a lake. I also do five or six core stability sessions of around twenty minutes each; these were originally rehabilitation exercises and have developed into an almost daily habit. I wear a pedometer twice a week – once during the week and one day at the weekend – and make sure I walk at least 10,000 steps on each of those days. And I have one rest day per week. Now that I’ve had a taste of open water competition, I’ll be getting some coaching in the pool this winter with a view to maintaining good health and tackling a full season next summer. I might come back home to swim a race in a loch. Wish me luck! 1976-1996 (Senior): Inter-county standard cross-country runner; decent club standard track runner; no individual honours at national level; pbs that would stand up well nowadays (those of us of a certain generation all say that) but were commonplace in the heyday of UK middle distance: 1:57, 3:57, 8:28, 14:44, 30:58. 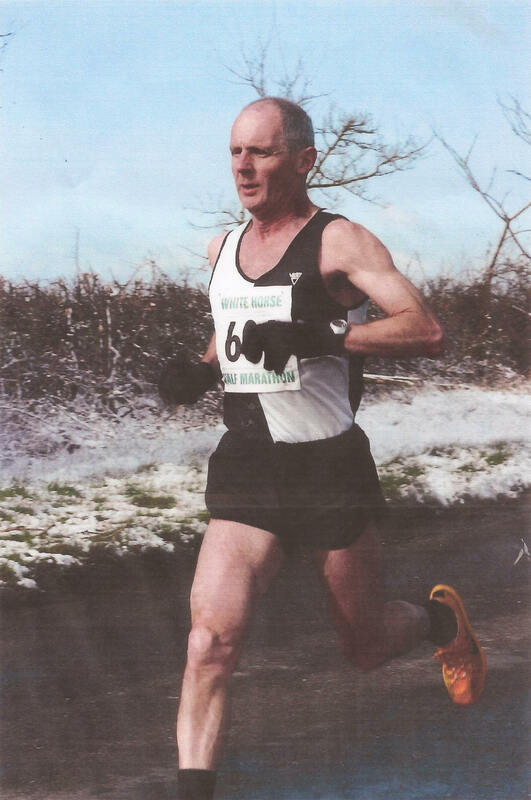 2004/05 XC (M45): 3rd Scot XC, 3rd UK 3,000m i, 1st B&I XC, 1st Euro XC; won Wsx Lge (senior & master); won seven races against all ages; 15:52 5K, 25:43 5M (93.3%), 72:01 HM (all age 48); 2nd to 2004 Olympian & club-mate Matt O’Dowd in first Swindon HM.